100% attribution is given to the last channel just before the conversion. For example, the user clicked on an ad closes it and then returns using an organic search then the last channel (organic search) will be attributed 100% for the conversion. 100% attribution is given to the last channel just before the conversion ignoring the direct clicks. For example, the user visited the site after clicking on an ad and then re-visited it by directly opening the URL, the attribution would be passed onto the ad. 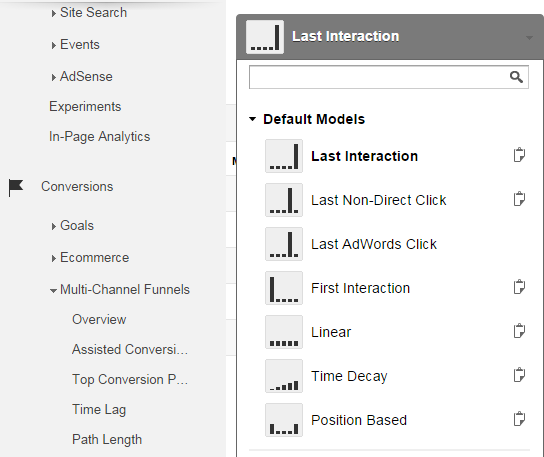 This model gives attribution to the last adwords ad that the user clicked before the conversion. For example, the user visited the site using organic search then via adwords, then again by social media. The attribution would be given to adwords. Under this model, the attribution is given to the first channel that assited in conversion. As per the example above, it would be attributed to organic search. This model gives equal attribution to each and every channel used in the conversion. As per the above example (last adwords click), equal attribution would be given to each channel namely organic (33.33%), adwords (33.33%) and social (33.33%). This is a custom model allowing you to define a certain percentage of attribution to each of the channels contributing towards a conversion. For example, you can define 40% attribution to the first and last channels and 20% to the middle channel/channels.